The first presidential debate between Barack Obama and Mitt Romney highlighted just how much is at stake when the contenders for the White House go head to head on live TV. 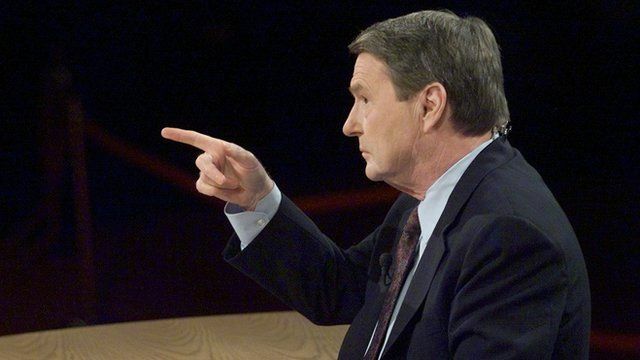 But there was one other man on the stage - and almost as much attention has been paid to Jim Lehrer's debate performance. While critics accused him of being ineffective and allowing the candidates to roll over him, the PBS presenter told the BBC he was happy with how the debate went. "I could have shut them up by being the big TV anchor man," he says. "But I would have made a big fool of myself." Instead, he says, the public got the "open debate" that he and the commission which runs the debates wanted, with the candidates able to talk to each other directly. Mr Lehrer has been the man in the middle 12 times, presiding over debates involving both President Bushes, Bill Clinton and challengers such as Ross Perot, Bob Dole and John McCain. He talked to the BBC about his new book Tension City, which was how President George HW Bush described the atmosphere at a presidential debate.